When Dr. Vollmer, the inventor of the Simulacron, a virtual reality world, dies in the eve of the huge conglomerate taking an interest in the project, they bring in a springy scientist Fred Stiller to take over the research. Fred has some reservations for the job since his predecessor died under mysterious circumstances, but happy to oblige to the given task, as the project is a scientific milestone. Odd things start happening around him though: he suffers from constant headaches, his friend at the company disappears in mid-conversation and nobody notices that he is gone. What's more, no one acknowledges that his friend ever existed. Then there are blackouts and memory lapses. Something is definitely wrong. Fred discovers that the world he sees as real is not at midpoint of the film's 3 hour running time. His existential crisis is similar to that of Hari, Kelvin's dead wife, created by the famed planet in Tarkovsky's Solaris. 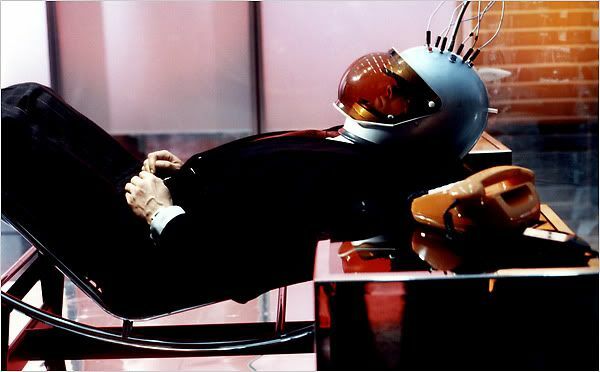 Fassbinder tapped into the concept of virtual reality, way before Matrix. Its obvious influences are everywhere- the phone booth, contact/oracle and whatnot. But his approach is not some dumb, action filled, overblown, self-important fantasy, but got a lot more to do with identity crisis in the technologically infused world- our world. It's a talky film filled with fashionable women and colorful plastics. There are hardly any action or special effects. Nonetheless it's very intriguing and entertaining from start to finish.